A giant bubble blown by the massive Wolf-Rayet star HD 50896, the pink star in the centre of the image. In this space wallpaper, a giant bubble blown by the massive Wolf-Rayet star HD 50896, the pink star in the centre of the image. X-ray data from XMM-Newton’s EPIC camera are shown in blue, while optical images were acquired using the Michigan Curtis Schmidt Telescope at Cerro Tololo Inter-American Observatory (CTIO) and presented in red (H-alpha) and green (OIII). 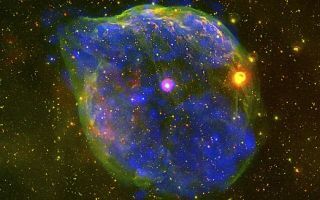 The bubble, known as S 308, is about 60 light-years across and is located 5000 light-years away in the constellation of Canis Major.